Many homeowners in the Halifax area are seeing their outdoor activities curtailed by swarms of aggressive European fire ants, which deliver a painful sting. European fire ants arrived in Maine in the early 20th century but didn't become a notable problem in Canada until just a few years ago. ((AntWeb))They look so harmless. 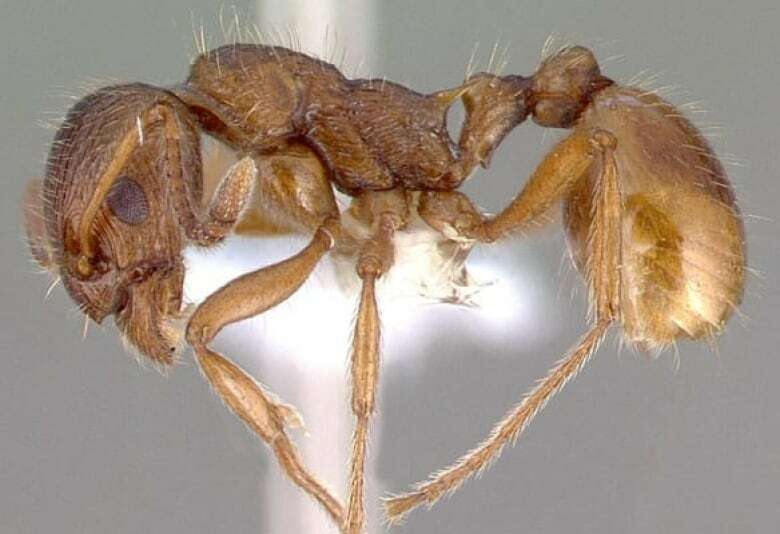 But anyone who's been swarmed by European fire ants (Myrmica rubra) knows how painful and frightening an attack from these tiny critters can be. Homeowners in affected areas quickly find that mowing the lawn, weeding the garden or hanging the laundry become elaborate protective exercises in ant avoidance. As for letting one's kids play in affected backyards … forget it. They're not considered a threat to crops or forests, so the ants are classed as nuisances rather than pests. But make no mistake. These are tough, aggressive insects, and they're not about to be displaced any time soon. European fire ants are native to the northern parts of Europe and Asia. They were introduced to North America in the first half of the 20th century, likely through infested containers of plants shipped to Maine. This species of ant doesn't seem to mind the cold, so climate has not slowed its steady spread northward. Its arrival in Canada is relatively recent. Since they like humid conditions, infestations tend to be more severe in coastal areas. So far, European fire ants have been spotted in open grassy areas, on the edges of forests, and in a few residential areas in Ontario, Quebec, New Brunswick and Nova Scotia. The Halifax area is a current hot spot. Fire ants like moist environments and often establish nests inside decaying logs, in soil, under rocks or debris, and even in potted plants. Multiple nests in one property are common. In fact, it's not unusual to find a dozen nests in an area of just 10 square metres. They don't nest in obvious large mounds, making it very easy to stray into fire ant territory. European fire ants establish their nests in the root zone of vegetation. "Colony budding," as it's called, takes place when a group of ants, along with the queen, moves from the original colony and sets up a new one close by. Ants can also spread when residents unknowingly help the ants leapfrog about town by transporting infested logs, plants, mulch or fill. The worker ants are very small — four or five millimetres in length — reddish-brown in colour. But not all reddish ants are European fire ants. Unlike many ants which have a constricted waist with one segment, European fire ants have a constricted waist with two segments. The middle body section also features two backward-pointing spines. But you'll need a magnifying glass to see them. What do ant stings feel like? Unfortunately, the ultimate identification may come by way of an attack. While most ants in Canada don't end up hurting people, European fire ants deliver a painful sting that some have compared to a hornet sting. A sting can produce an inflamed red area that can be two to 10 centimetres wide. The severity of the reaction depends on the individual and the location of the sting. An initial burning sensation is often followed by many hours of soreness. Some stings can trigger a severe allergic reaction. How can I get rid of European fire ants? Native ant species in North America are no match for their European cousins and are usually displaced by them. European fire ants have no natural predators in North America. Control and eradication is up to humans. For small infestations, bait stations using boric acid or borax can be effective in the short run. Resist the temptation to make an especially potent batch, however. If the bait is too powerful, it will kill the worker ant before she's able to carry it back to the queen. For large infestations, professionals should be hired. Find out if you have neighbours with similar infestations. For any eradication effort to succeed, everyone will have to sign on. And brace yourself for the possibility that the ants may return after an apparently successful chemical treatment. To prevent infestations, people should remove any debris, decaying trees or logs from their yards (ensuring first that the wood isn't already infested.) Keep the grass short. Get rid of weed-inhibiting fabric. And be very wary of accepting that gift of plants or soil from a friend who lives in an area where the ants are known to live.